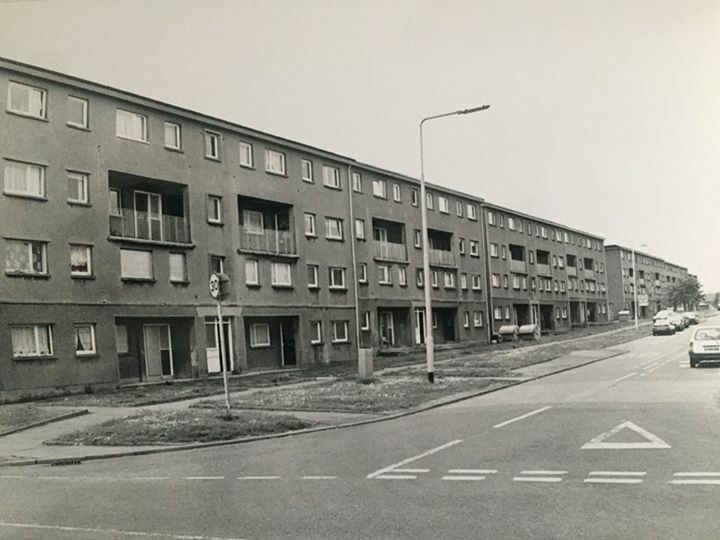 Photograph of flats in Trondheim Parkway in Abbey View which have now been demolished. I live on Trondheim Parkway West now. Was this all previously Trondheim Parkway? Which end of the street is this? Kim – can you remember it like this? This picture shows the south side of Trondheim parkway. I remember these flats being built by local builder J Colville. We stayed on the north side in the flats built by Wimpey. Moved in 1959 into no 99. Later in 1966 moved across the road to no 108. Remember when it was all just fields no Inchkeith dr,Mackie pl or Drum rd. We used to live in the bottom corner flat before turning Mackie Place…. Used to get some great tips delivering milk in this street. They didn’t have much to give but always looked after the milk boy. I used to deliver the bon accord juice there on a Saturday.. I lived in Islay Road when Trondheim Parkway was built. My childhood recollection is of a big fuss getting made when the street was opened by the Mayor of Trondheim. I may be completely wrong in that! My memory is of the opening happening at the junction with Allan and Duncan Crescent. Back then we used to walk the woods where Dulloch Park is now and I remember family picnics there. Yes away in the 90s the usual happened. They started housing outsiders and it all went to pot. Aren’t these the maisonettes? We lived at No 66 till we moved to the Highlands. They were 3 bedroomed, good size.The flats were opposite…. that is the exact spot that a Hotpoint van knocked me down. I was coming back from a fancy dress party dressed as Little Miss Moffet and I ran in front of the bus to cross the road. I remember mum picking out the gravel from my leg with tweezers and painting Eosin on me which stung like hell.